Toddy cutting is tricky! A particularly adept toddy cutter can get about two pints of toddy in a day from one spathe. A non-adept toddy cutter…not as much. Why drink toddy? If you drink toddy right from the coconut it’s refreshing, and also quite good for you. If you leave it out in the sun to ferment for about fifteen hours it will ferment, and become coconut wine. Toddy cutters usually do their work in the very early morning, at dawn or even earlier, or at the end of the day, toward sunset. Toddy cutters very often sing, and sing loudly. Why would someone sing at the top of his lungs while high up in a coconut tree? One reason, relayed to All Around This World by Mike Wright, former Peace Corps volunteer in Kiribati and author of Wright’s English to I-Kiribati Dictionary, is that toddy cutters are singing to let women know they’re up in the trees so the women won’t use the often-roofless outdoor shower houses, called “rokis,” until toddy cutting is done. Whatever reason toddy cutters sing, they sing, and we will too. 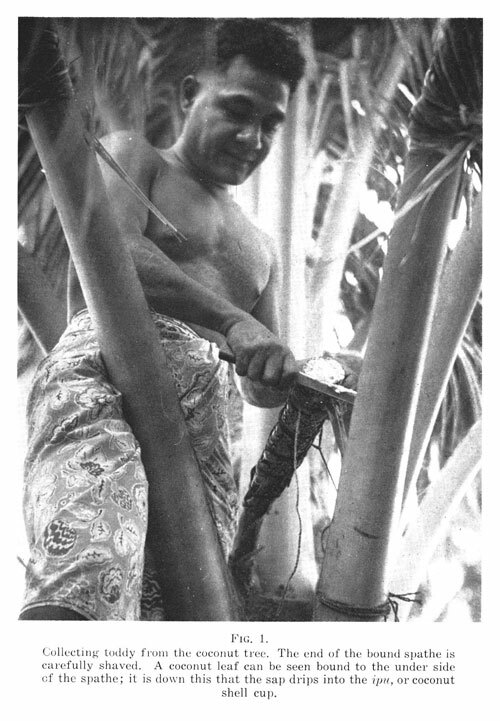 In class we’re going to listen to “Toddy Cutting Songs (Kiribati)” from David Fanshawe’s Spirit of Micronesia while we learn how to cut toddy, then maybe even come up with some toddy cutting songs of our own.